No, I didn’t read a novelization of the awesome James Cameron movie, The Abyss. This Abyss is the third book in the Deep Space Nine compendium, Twist of Faith, that I started reading last September. Remember how much I loved book one and book two of S.D. Perry’s Avatar? This time the book wasn’t written by Perry. Instead, the story was done by Jeffrey Lang and David Weddle. Admittedly, I was a little spoiled by the powerful kickoff that Perry provided for the DS9 “eighth season” with her amazing two-parter, but I was willing to give this third book a shot (especially considering the fact that it’s part of this collection that I’m obviously keeping if only for Perry’s novels). 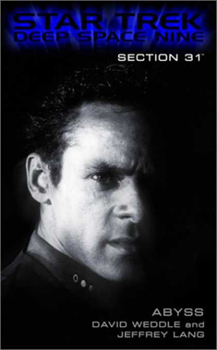 The problems I had with Abyss right from the start were two-fold: 1) the story focuses on Section 31, which was one of my least favorite additions to the Star Trek mythology; and 2) the book focuses on Julian Bashir. When I first watched DS9, I hated his character. That hatred has mellowed considerably throughout the years and, if anything, is now a tepid acceptance with mild spikes of “like.” However, combine both these issues and you’re really not starting out on a positive note with me regarding your tale. I should point out here that this novel was part of a four-book Section 31 story arc that ranged from the original Star Trek to The Next Generation, this DS9 story, and finally Voyager. Knowing that this was one part of a four-part story, I was a little worried that I wouldn’t understand what was going on in my part of the arc (but not worried enough that I ever considered buying the other three novels; again, I really don’t like Section 31). However, Abyss worked perfectly as a stand-alone story. If there was anything missing, I couldn’t tell. This book does tie in with events that took place in Avatar, as it should. Lang and Weddle did a great job, in fact, of connecting their story to Perry’s novels, picking up nuances and threads throughout. I very much enjoyed these aspects of the novel. There were also some great character development moments that were worth the effort to find as well. One of the greatest joys of all these eighth season DS9 books thus far has been the care and quality the authors have invested into character development. The DS9 crew is being handled in ways almost more impressive than they were on the actual show. Regardless of my lack of enthusiasm over the actual Section 31 story, I still enjoyed reading this novel. If you did like Section 31, then you’ll probably enjoy it even more. It’s a well told tale with wonderful character moments scattered throughout. I’m still very much enjoying what they’re doing with Ezri Dax. There were equally intriguing moments concerning Ro Laren as well as a plot point concerning Colonel Kira that was kicked into motion by the events of Avatar and has left her quite vulnerable to those who do not wish to see her continue as commander of Deep Space Nine. I’m very glad there’s still another book to go in this compilation (along with a short story), because I don’t want my time with the eighth season to come to a halt just yet. If things keep running at the impressive pace of the first three books, I will definitely be continuing with the next batch of novels in this series.